LMG's stay at min spread post inaccuracy period. Is there a formula that calculates the hit rate based on the cone of fire set by an 'LMG's' ADS min spread. (which is essentially an invisible cone from what I understand). * Actually its probably cylindrical, cone is more increasing spread right? Basically, once the target escapes the confines of the hypothetical cone of fire, then hit rate should start to drop. Is this possible to calculate? PS: I have seen someone commenting that the Huot LW's 0.18 ADS min spread allows it to achieve 100% accuracy to the upper chest @ 125m. I cannot find the source of this but I am positive I have seen it here or at least on Reddit somewhere. You use Distance*tan(spread) to obtain the maximum deviation at that distance in meters. Then you just see how it stacks up against the 0.25m radius chest hitbox. ADS min spread. (which is essentially an invisible cone from what I understand). * Actually its probably cylindrical, cone is more increasing spread right? The spread is s in degrees. 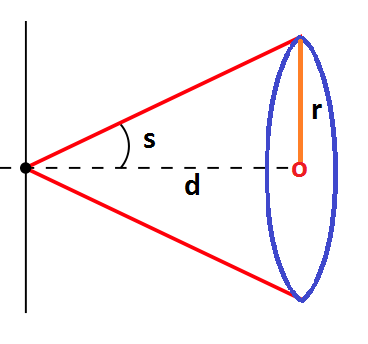 The radius is r and the target distance is d.
The shape is always a cone*, like your phone's flashlight. This is because the bullets only have one point to spawn at (the black dot to the left) and follow a straight line* as they travel. If the spread increases over time, the cone gets wider. If it decreases (as with LMGs) the cone gets more narrow. * This is a slightly simplified model since it ignores gravity (and drag). A one-inch grouping at 100 yards (91.44 meters) is just shy of 0.016 degrees (tan^-1(1/3,600)), which is also a tiny bit less than 1 MOA (1/60th of a degree). As such, at 125 meters and 0.18 degrees of minimum spread, you'll have a grouping of about 15.46 inches or just under 0.393 meters. Of course, that's not entirely true since you'd have to also factor in recoil. I also don't know the character dimensions. Another factor is shooting stance. A target that crouches or prones will obviously be more difficult to hit, but at the same time, if they are hit, it'll more likely be an extremity. One last thing to note is that wielding your sidearm puts you into a one-hand stance that positions your side towards the enemy, and thus decreases your profile. Of course, successfully defeating a Huot user with a handgun at 125 meters is quite a crapshoot. One last thing to note is that wielding your sidearm puts you into a one-hand stance that positions your side towards the enemy, and thus decreases your profile. Of course, successfully defeating a Huot user with a handgun at 125 meters is quite a crapshoot.